When I drink the finest whiskies in the world I want to control all the things that I can control. I want to first make sure that my glass is clean and free of any scents or chemicals from the dishwasher. It's always my intention to hand-wash my tasting glasses, but even then the way to wash them is to use no soap... and that is problematic at best. So what to do? The first thing that I do is buy a gallon of white vinegar. I soak my glassware in a 40/60 wash, vinegar to cool water overnight in a non-reactive bowl made of glass. Any smells or flavors are neutralized by the low PH and high acidity of the white vinegar. Then instead of throwing out the washing solution, I'll add it to a bucket and disinfect my mop heads. It's pretty amazing stuff. So when it's my turn to test new liquors or combinations of liquor and water- I want a perfectly clean glass without any residue. Barrell Whiskey is exactly what I want in my tasting glass, the only downside is the fact that it's just after 11:30 in the morning. I want to taste the sprits but I don't want to get plastered on the 122.5 Proof spirits at this tender hour of the day! So what to do? Well, judging by my whirlwind tour of the International Fancy Food Show, I stumbled upon several intriguing products that single day I attended. One of these memorable products is named Drink Maple and it's just that. Maple Water straight from the tree. But how do they do this? The last time I cut down a maple tree it was just after Hurricane Sandy lay waste to the forest. I was stacking wood and came upon a fallen maple tree. My saw got stuck several times because of the high liquid content of the wood. Maple is very hard to burn in a woodstove unless it is perfectly seasoned- and that might take a couple years of sun, freeze, snow and thaw. There's a lot of liquid in there. I suppose the owners of the Drink Maple company have figured out how to tap this liquid in large enough amounts to make a product like this viable. When I think of the wood and what caused my saw to lock up, I couldn't imagine extracting the liquid. But inside the lovely, curvaceous bottle is something cooling and lithe. It has a subtle sweetness and an opulent mouthfeel. It is thirst quenching and strangely calming. And when a mere splash is added to a glass of Barrell Whiskey, magic happens. 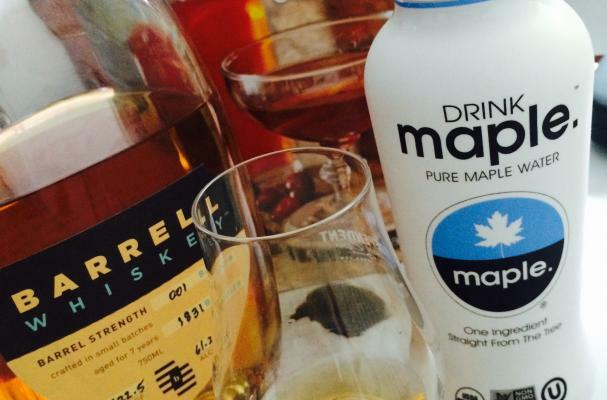 I really feel strongly about this Drink Maple: Pure Maple Water and I want to share my tasting notes with you. Take one ounce of Barrell Whiskey.. The blue topped version is what I'm drinking.. 122.5 Proof. Batch #001. Add a mere splash of the Drink Maple. And know you have in your hand right now is one of the best things in the world. My Third Book is out now! Bitters and Shrub Syrup Cocktails. Please click through for more information! Thank you.